“Packaging plays a crucial role in the marketing mix – it is the most concentrated brand experience available to a marketer. It encapsulates the entire brand in a space that is often smaller than a shoebox, but that has the most intimate connection with your consumer, It is also the best example of what consumers recognize most strongly when referring to a brand,” says Rex co-founder Rudo Botha. In a bid to make the most of the small space on the Duco can, Rex delved into the Duco brand – and uncovered an insight that not only formed the core of the packaging solution, but that now sits at the heart of the brand itself. 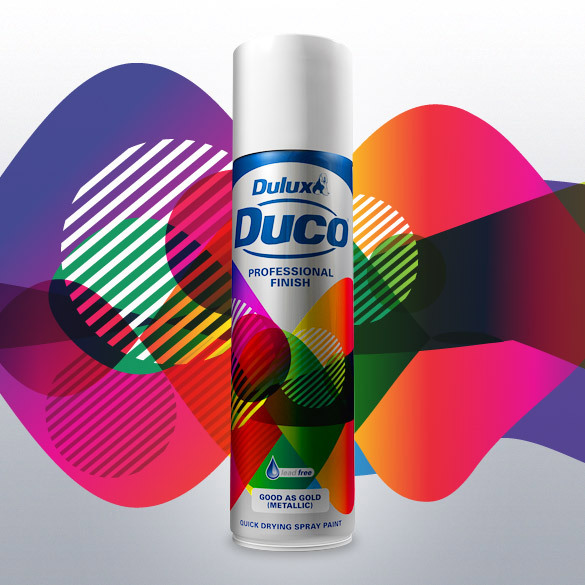 “Dulux Duco is the ‘Hoover’ of the spraypaint sector. The brand has become a verb, but the problem is that the verb had very specific connotations – connotations that were out of line with actual product usage,” the design team explains. Over the years, Duco had become a generic term for spraypainting – but mainly in an industrial sense, in a garage, in the hands of a mechanic and DIY-man. Upon investigation, Rex discovered that the market has evolved beyond this perception, and that the current – and future potential – lay in homes, in the hands of creative women who were using Duco for a wide variety of creative and eclectic applications. As an added bonus, the home décor market is growing rapidly, representing huge growth opportunity for the brand. In a bid to create a pack that was more in-touch with this new market, Rex veered away from the functional and solutions-oriented packaging that is typical of the DIY market, and instead created a pack that embraces creativity and invites imagination. “We don’t want to tell people what to do with Duco, because the truth is we don’t know what they will be doing with it – and it doesn’t matter. As long as they are attracted to the energy the brand oozes, our job is done,” say the design team. “Now more than ever we are convinced that branding only works when it pulls consumers, instead of pushing onto them,” concludes Botha. The result is a vibrant pack that not only stands out among its functional shelf-mates, but that also invites consumers to create their own meaning of the verb ‘duco’, taking the brand out of the garage and integrating it with modern lifestyles.